Luna Pizza is a small Italian restaurant in the back corner of a shopping center in Longwood. It's actually pretty easy to miss due to it's location, but yet they always seem to have customers. On one visit, I ordered an eggplant parmesan sub. It was good, although it was very oily. The sandwich was huge and was also a few dollars cheaper than what other nearby Italian restaurants charge for a similar sandwich. On another visit to Luna Pizza, I took home a Bianca Spinach Pizza. This sauceless pizza was topped with mozzarella, riccota, fresh spinach, and lots of garlic. I was really pleased with the pizza. It had plenty of flavor, even without sauce. In spots, the crust seemed like it could have been cooked a few minutes longer, but other than that, I have no complaints. Good pizza, and adding garlic knots into the pizza box only makes it better! I recently tried La Fiesta Mexican Restaurant in Longwood. 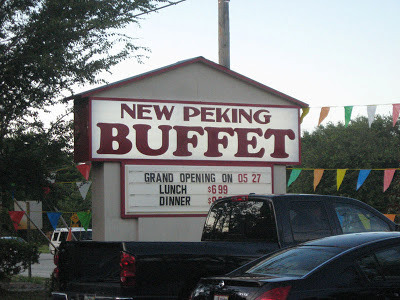 I had been to the Chinese buffet that was in this location formerly, but for some reason I never got to La Fiesta until recently. I ordered the Traditional Combination #1, served with a taco, enchilada, refried beans, and rice. The taco came in a crispy corn tortilla filled with chicken, lettuce, and cheese. The enchilada was stuffed with chicken and was topped with melted cheese and a somewhat spicy red sauce. On a return visit with a coupon from La Fiesta's Facebook page, I tried the Enchiladas de Mole. While there are many different types of mole, the standard mole served in Mexican restaurants in the United States is specifically called Mole Poblano. This mole is made with chocolate, chilies, and other good stuff. The Enchiladas de Mole consisted of three chicken enchiladas topped with this awesome sauce. It's spicy, smoky, and chocolately all at the same time. My tongue couldn't decide whether I was eating dinner or dessert with the great mix of flavors in the sauce! New Peking Buffet recently opened in the building previously occupied by Barnhill's Buffet in Casselberry. 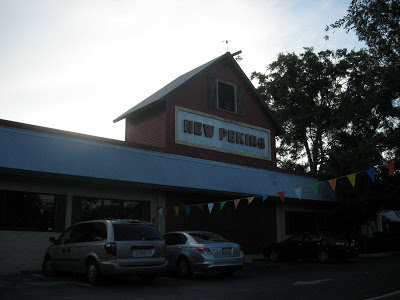 This Chinese restaurant didn't do much to change the outside of the barn-like building. Contrasting with the outside, lots of Chinese style architecture and decorations were added around the interior of the restaurant, removing just about all trace of the country theme left by the previous occupant of the building. Next I tried some dumplings, vegetable rolls, krab rangoon, and a sesame ball. Mel's Family Diner has been in Sanford for as long as I can remember, but until recently, I have never eaten here. The outside of the orange and tan building doesn't exactly scream diner, but on the inside the restaurant does indeed look like a diner of a different era. I ordered the Crazy Hash off the breakfast menu. This consisted of hash browns with peppers, onions, and sausage, served alongside scrambled eggs and a biscuit. I was actually expecting more peppers and onions with the potatoes, but it was still pretty tasty. Cone Heads South is a small ice cream shop in downtown Deland. I recently gave them a try while driving though the town. While in Palatka, I ate dinner at Corky Bell's Seafood & Steaks. The restaurant had a 10-15 minute wait when I arrived, so I filled the time by admiring the wonderful view of the St. Johns River. Soon, the buzzer went off and it was time to be seated. My meal started out with a nice side-salad with oil & vinegar. For my main course, I choose the two item seafood dinner. I went with the grilled shrimp and blackened fish. The type of fish wasn't identified on the menu, nor did I ask what type it was, but I was served a nice flaky white fish. The seafood came with a side of cheese grits and two hush puppies. Everything served with this meal was really tasty! The service was a little strange at Corky Bell's, but the food was good and the restaurant's location on the river was great! I had a coupon for a free Spicy Chicken Sandwich from Chick-fil-A and used it at the store on Colonial Drive in Orlando. I ordered the Spicy Chicken Sandwich and a small order of waffle fries. I liked the sandwich better than the normal Chick-fil-A fried chicken sandwich. This had much more flavor, but the sandwich was not as spicy as I would have expected. They charged me $0.15 for lettuce on the sandwich though. Other fast food restaurants put lettuce & tomato on their sandwiches for free, so I found this a bit surprising. Chick-fil-A also threw in a box of Hot Tamales to go with the spicy chicken! I recently used Facebook to get a coupon for a free bagel at the Einstein Bros in Maitland. This building started it's life as a Perkins (or possibly Friendly's?). The original chain restaurant was replaced with The Loop, who served average pizza. After The Loop came and went, Za Bistro moved in. Out of the restaurants that have served food inside this building, Za Bistro was definitely my favorite. They had really good sandwiches and awesome pizza, but they didn't last either. That brings us to present day with Einstein Bros Bagels. It's not quite as exciting as creative Italian food from Za Bistro, but I can't complain about a chain that regularly gives out free bagels! I had a sesame bagel with smoked salmon cream cheese. Can't go wrong with that! It's been a long time since I've visited a Tijuana Flats. I had a bad experience at one of their stores that turned me off to the chain, but I recently gave them another try. For this meal, I visited the Tijuana Flats in Longwood in a Publix shopping center. I ordered the Dos Enchiladas. These enchiladas consisted of corn tortillas filled with chicken and lettuce, topped with cheese, chipotle sauce, sour cream, jalapenos, black olives, green onions, and chopped tomatoes. These were actually really tasty. I really liked all of the toppings on the enchiladas, compared to the normal cheese and sauce toppings that you get elsewhere. I didn't go in with Tijuana Flats with high hopes after my last experience with the chain, but I think they won me over again as an option for fast food faux-Mexican food. I visited the 2010 Blue Crab Festival in Palatka, FL that happened over Memorial Day weekend. I had the full intention of eating crab prior to going, and it sounded even better when the price of blue crabs at one stand was lowered to $1. When I went to buy the crabs, I found out they were putting the cooked crabs into plastic bags and handing them over. None of the normal crab eating equipment was supplied at the festival. There were no mallets, crackers, or little forks. If I wanted to eat the crabs as a late lunch/early dinner as I had planned, it would have required the removal of crab meat from the shells with my bare hands. This seemed like far too much work to make it worthwhile, so I gave up on my idea of having crab for dinner. It was decided that rather than buying the evening's seafood from the festival, we would go to a nearby restaurant instead. Before leaving the festival though, I did buy a tray of these fresh cut potato chips, topped with sriracha. There were no hard shells that needed to be removed on these potatoes, thus making an ideal festival food. 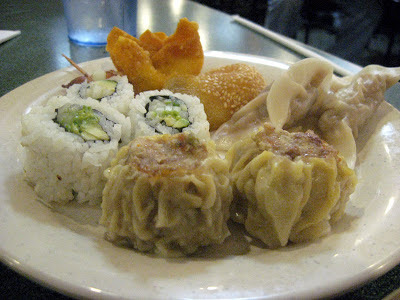 I picked up some Chinese takeout from King's Wok next to Albertson's in Longwood. After returning home, I started with some wonton soup. It had a flavorful broth, plenty of good sized wontons, and shredded pork at the bottom of the soup container. 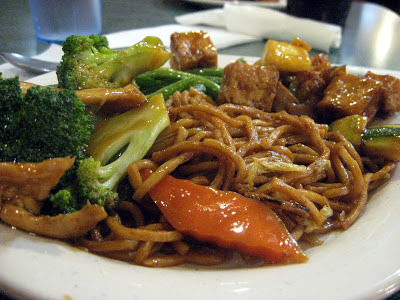 For the main dishes, I shared two different items. First was the Chicken with Black Bean Sauce. It came with plenty of tender chicken, peppers, onions, carrots, and water chestnuts. Unfortunately, I didn't like the sauce all too much. 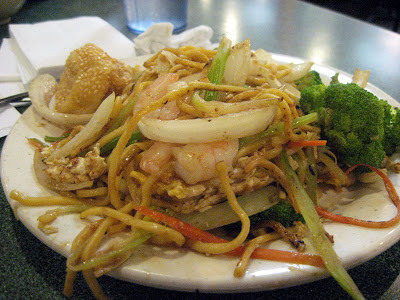 It had a sweet flavor, which I was not expecting, being that this dish is normally more savory than sweet. There weren't enough beans either. Overall, it was okay, but not the best. Next was the Chicken with Broccoli. Can't get much simpler than this, consisting of what the name implies. I definitely preferred the sauce on here over the black bean sauce. Except the black bean sauce, I enjoyed my Chinese takeout. I'd come back to give King's Wok another try!